On Monday (9/11) I have once again have the opportunity to spend time with friend and radio host Georjean Trinkle on her internet radio show Hot in Hunterdon. We’ll be talking about the Frank Nagler mystery series published by Imzadi Publishing, THE SWAMPS OF JERSEY, A GAME CALLED DEAD, and the new one, released in April, THE WEIGHT OF LIVING. We’ll also talk about the works-in-progress in the series, a prequel, called so far, JUST COME HOME, and the one after WEIGHT, yet untitled. The challenge of writing this series has been to create a lead character, Ironton, N.J., detective Frank Nagler, who can hold a reader’s interest, and to create a setting, the City of Ironton, whose conditions, and ebbs and flows, present a compelling tapestry upon which to cast the action. Georjean has suggested that I read a couple short selections. I’m game. We may even talk about storms. “He had not seen the sky for days, felt the heat of the sun, wore dry shoes or walked outside without that raincoat since the storm blew in and sealed the hills above the city with a dense smothering grayness, a swirling menace of thunder clouds and shrieking winds that pounded the city with an apocalyptic rain that sent the Baptist preachers howling to the hills about sin and damnation. It emptied the grocery store shelves of everything but a few cans of cream of mushroom soup, and locked the residents in the top floors of their homes as the river crashed its banks, flooded streets and rearranged the city landscape like a madman with an earth mover. 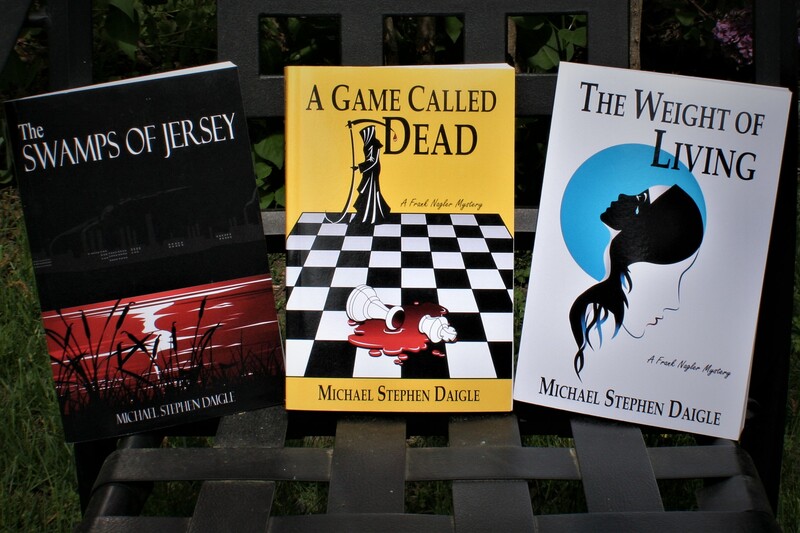 This entry was posted in BooksNJ2017, Fiction, Greater Lehigh Valley Writer's Group, Hot in Hunterdon; Georjean Trinkle, Imzadi Publishing LLC, Michael Stephen Daigle, Mystery Writers of America, radio, www.michaelstephendaigle.com and tagged "A Game Called Dead", "The Swamps of Jersey" Imzadi Publishing, "The Weight of Living", Fiction, Frank Nagler, Georjean Trinkle, Hot in Hunterdon, Ironton, Morris County, New Jersey. Bookmark the permalink.